Filed to: I NEED IT!Filed to: I NEED IT! I hop on Craigslist looking for drift missiles (procedure: go to craigslist, click cars + trucks, filter for RWD and manual, see what pops up) and this pops up not far from me. 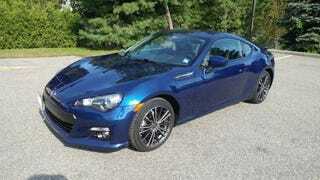 I got to drive and autocross my Dad’s BRZ on Sunday, confirming my belief that there is one in my near future. This ticks all the right boxes. Clean, un modified, manual, spoiler, fog lights, low miles. The cherry on top is the fact that it is Galaxy Blue Silica, my favorite Subaru color ever. Dammit, if it was 10 months from now I would be all over this.